Wearing red shirts and carrying Hawaiian flags, hundreds marched from the Royal Mausoleum to Iolani Palace yesterday afternoon to begin a three-day series of events protesting three court cases dealing with native Hawaiian issues. "We're not going to be quiet and silent and weep in the corner," said organizer Lilikala Kameeleihiwa, director of the Kamakakuokalani Center for Hawaiian Studies at UH-Manoa. "We will seek justice for native Hawaiians no matter what happens in the courts. We will march and we will march and we will march." The protesters -- who wore red shirts to symbolize Hawaiian blood and aweoweo, a school of small, red fish that is seen as predicting a big change -- aim to bring attention to two cases that challenge admission policies at Kamehameha Schools and one that questions the constitutionality of the Office of Hawaiian Affairs and the state Department of Hawaiian Home Lands. The 2-mile march from the mausoleum in Nuuanu to Iolani Palace on South King Street was followed by speeches, music, hula and oli, or Hawaiian chants, on the palace lawn through the night. Before the march, more than 300 gathered at the Royal Mausoleum, or Mauna 'Ala, to honor alii with chants and tidings of leis and red roses. "We're here to honor those who have come before us and laid the foundation," said Dirk Soma, a Kamehameha Schools administrator in the extension education division whose wife and two children also attended the ceremony and later marched to Iolani Palace. Hawaiians from a number of local civic groups marched down Nuuanu Avenue to Iolani Palace. 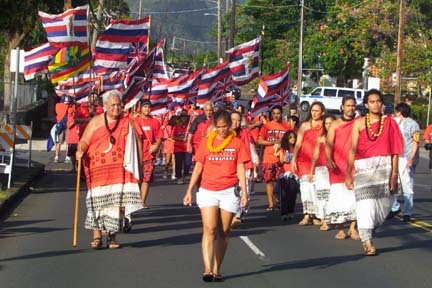 The red they wore symbolized Hawaiian blood and aweoweo, a school of small fish that is thought to predict big change. Organizer Manu Kaiama, of the Native Hawaiian Leadership Project, said she hopes the gatherings "really make a statement that we don't like what's going on in the courtroom." Honolulu Community College student Lacy Solis agreed. "We're here, and we're trying to stand up for ourselves," she said while holding a sign at the mausoleum's gates before the march that read "Ku I ka pono," or "justice for Hawaiians." The ceremony marked the beginning of a number of scheduled protests that coincide with arguments in the Arakaki vs. Lingle lawsuit, which were set to continue today, as well as proceedings in the two Kamehameha suits. In the Arakaki lawsuit, 16 Hawaii residents seek to abolish OHA and the Hawaiian Home Lands Department, alleging their programs are race-based and discriminate against non-Hawaiians. Proceedings in the Doe vs. Kamehameha Schools case were also scheduled for today, while the Mohica-Cummings vs. Kamehameha Schools case is scheduled for tomorrow. Both challenge the school's admission policy, which gives preference to native Hawaiians. "All Hawaiian issues are being attacked at this point," said Geanine McIntosh, an employee at Pihana Na Mamo, a federally funded education project for native Hawaiians. During their second day of events surrounding the cases today, protesters were expected to stage a candlelight procession at sunrise from the palace grounds to the U.S. District Courthouse, where the Arakaki and Doe cases will be heard. At 8 a.m. tomorrow, demonstrators will gather at the federal courthouse again for the Mohica-Cummings case. "I think that we need to stand up for what is right and what is just, and we need to take care of ourselves," said Kerri-Ann Kealohapauole Hewett, a professor in the University of Hawaii's College of Education who attended yesterday's ceremony and expects to participate in the other gatherings. Before the march yesterday, more than 300 gathered at the Royal Mausoleum, or Mauna 'Ala, to honor alii with chants, dance and gifts. Kaimuki resident Pam Kapana, who marched with her daughters yesterday, said native Hawaiians and non-Hawaiians alike should stand up against the court cases, which threaten millions of dollars in educational programs, loans, leases and other benefits for native Hawaiians. "People try so hard to honor indigenous land and indigenous plants," she said, "but why don't they honor the indigenous people?" 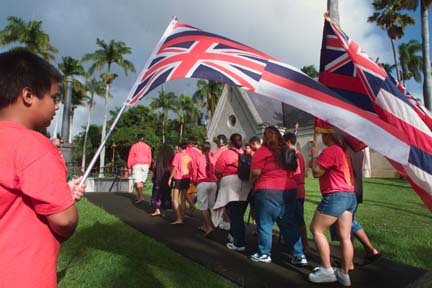 Organizers pointed out that a number of non-Hawaiians attended yesterday's events at the mausoleum and palace. Nuuanu resident Liane Davidson was one of them. "It's not just the Hawaiians who feel wrongs were done," she said. "I hope my voice will blend with theirs and my voice will be loud." The march was organized by several organizations, including the Ilioulaokalani Coalition, which organized a march in September that more than 8,000 demonstrators attended as a prelude to a hearing on the Arakaki lawsuit. Organizers for yesterday's march had originally said they expected as many as 20,000 to walk from the mausoleum to Iolani Palace. But coalition President Vicki Holt-Takamine said the march and ceremony coincided with a number of other events of native Hawaiian interest, including the Association of Hawaiian Civic Clubs Convention on Kauai.